Ed Miliband has signalled he will not sign up to David Cameron's plan for a new UK-wide devolution settlement in the wake of the Scottish referendum. Mr Cameron wants enhanced powers for the Scottish Parliament and new powers for English MPs at Westminster agreed, in draft, before the 2015 election. 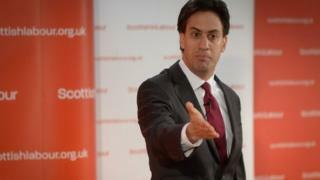 But Mr Miliband wants a "constitutional convention" after the election to discuss devolution plans for England. And he says the focus should be on new powers for the English regions. Scottish First Minister Alex Salmond says Scottish voters - who rejected independence in Thursday's referendum vote - would be "incandescent" if there was any "slippage" in the UK government's accelerated plans for further Scottish devolution. The prime minister has pledged to honour promises made during the referendum campaign by his predecessor Gordon Brown - and backed by the main Westminster parties - to hand greater powers over tax and welfare to the Scottish Parliament and to publish draft legislation in January. But he has said that changes are needed, at the same time, to the way England is governed - as well as new powers for Wales and Northern Ireland - to ensure the settlement is "new and fair". In particular, he wants a simultaneous review of the role of Scottish MPs at Westminster, amid Tory calls for them to be barred from voting on legislation and other matters only affecting England. At the moment, Scottish, Welsh and Northern Irish MPs can vote on English-only matters, such as schools and health, but English MPs do not have any say on devolved matters elsewhere in the UK. Mr Cameron has said he wants substantial progress on the two issues within the next six months. In response, the Labour leader said he accepted the need for reforms and the process of debate should begin before the general election, to be held on 7 May. Labour has insisted it is sticking to the same timetable for Scottish devolution set out by Mr Brown - and that legislation can ultimately be passed on both issues in the next Parliament if it wins power. But the BBC's political correspondent Robin Brant said Labour - which has more than 40 Scottish MPs - wanted effectively to "decouple" the two issues. Mr Miliband said devolution in Scotland and Wales over the past 15 years had worked and recognised the demand for "significant" new powers for England. But he said Scotland should be dealt with first, in isolation, and warned against a "quick fix" deal on English matters agreed "behind the scenes" at Westminster. "We want to go as fast as possible...but we need to consult people and we need to get this right. One lesson we know is that we can't do this in a knee-jerk way. We have to do this in the right way." He added: "We need a response that matches the scale of this moment. That starts with delivering on our promise of further powers to Scotland. "But other people in Britain, including England, now deserve the chance to shape their own futures with a dynamic devolution settlement." Under his plan, English regions would produce a series of recommendations "covering how sub-national devolution can be strengthened; how the regions can be given more of a voice in our political system; how we can give further voice to regional and national culture and identity'". Mr Miliband said a Constitutional Convention would consider these and other proposals in the autumn of 2015, including reform of the House of Commons and the case for replacing the House of Lords with a new Senate of the Nations and Regions. Many Conservative MPs have said they will not accept more powers being devolved to Scotland without fundamental changes to voting rights and UK-wide funding formulas at Westminster. James Gray said it was time to "fundamentally and radically and rights the wrongs that are currently being done to the people of England". Reacting to Mr Miliband's statement, Tory chairman Grant Shapps said Mr Miliband's approach "would kick this vital issue into the long grass". "If he is serious about delivering on our joint commitment to publish draft legislation on devolving more powers to Scotland by January, Ed Miliband must say whether he supports an equal settlement for England - English votes for English laws," he said. Mr Salmond, who has announced his intention to step down as SNP leader and Scottish first minister, said the "common front" between the Westminster parties on a timetable for further Scottish devolution appeared to be falling apart. He suggested that the prime minister had refused to commit to a second reading on a new Scotland Bill during the course of the current Parliament - set to end in April. Labour MP Diane Abbott said the plan seemed to be "unravelling" and Labour may be punished at the general election if it did not deliver on its "solemn promise" on more powers for Holyrood.